Our boss Stephen Kelly, the Chief Operating Officer of HM Government, has announced today that he will be leaving government in a few months. He will go on to lead Sage plc as Group Chief Executive. We in the Government Digital Service have much to thank him for. Establishing new cultures and operations at pace is always difficult; in a place as changeable and febrile as Whitehall, it is doubly so. Cabinet Office is a loose collection of (often divergent) pieces of government, ranging from digital to constitutional and parliamentary affairs, and including things as diverse as property, procurement and parts of domestic security. 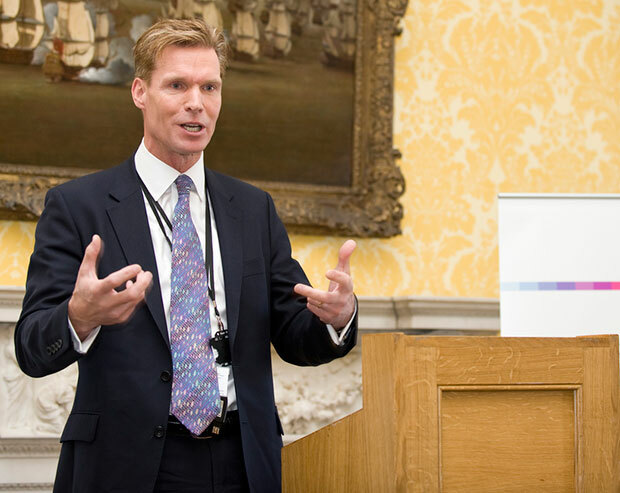 Stephen brought together many of the functions of Cabinet Office into the Efficiency and Reform Group, which has been responsible for the £14.3bn savings in 2013 to 2014 and important to driving our Minister's agenda, celebrated recently with the Chancellor. While that may sound like conventional group management, the challenge of dealing with so many conflicting agendas and doing so against a difficult political background cannot be underestimated. Through this Parliament, Stephen has been an unrelenting supporter and champion of GDS and of all things digital across government. He has opened doors to Ministers, spoken at events, helped remove and route around a huge number of obstacles to delivery, and always with a positive worldview. It's that last characteristic that I will miss most. As Tom reflected of the early days when GDS teams found their paths blocked in large departments, "Stephen always gave me and my team rock-solid support, even during situations where such support caused him profound inconvenience." I am not surprised he is going to lead in the private sector and I'm delighted he is going to a British software and services company. Our digital economy needs more success stories like Sage, and our digital and technical communities need permanence, beyond early stage VC-backed start ups and imported Internet brands. That gain for the UK economy is government's loss. I doubt Stephen will miss the parochial nature of Whitehall, but I hope he reflects that he has played a huge part in delivering the early stages of the UK Government's digital development. I have also met Stephen at Bath University on a couple of occasions and would agree that he is inspirational. This is a loss for the UK PLC but a gain for Sage. I am really sorry to see Stephen go. The few times I met Stephen I found him inspirational because of his positive approach to reforming government procurement and involving SMEs like Kahootz. If only we could afford to hire him!